William Reese. 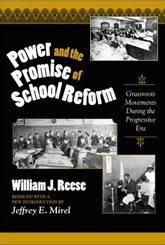 Power and the Promise of School Reform: Grassroots Movements During the Progressive Era. Rev. edition, Teachers College Press, 1986. This book is a comparative analysis of the tensions, compromises and conflicts over school reform in four urban school systems in the United States. In examining the contradictory forces that shaped urban education in the U.S., it illuminates how grassroots movements operated during the early twentieth century. Unlike many of the standard histories of American education, which focus on New England and Eastern cities, this study analyzes schooling in Rochester, New York; Toledo, Ohio; Milwaukee, Wisconsin; and Kansas City, Missouri. It explores the ways in which diverse community groups struggled to make local schools responsive institutions in a time of dramatic change. School reform was a dominant motif of the Progressive era, but community organizations from local Socialists to parent-teacher associations fought against the contemporary trend toward centralization and elitist politics. This book focuses on the social movements and people instrumental in the struggle for reforms, describing how organized women, labor, and urban radicals became dynamic, resourceful and successful participants in movements to improve schools in local communities.